MicroRNAs and their Argonaute protein partners constitute the RISC complex, which can repress specific target mRNAs. 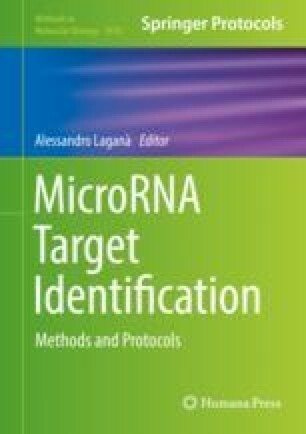 The identification of microRNA targets is of central importance, and various experimental and computational methods have been developed over the last 15 years. Most experimental methods are based on the assumption that mRNAs which interact physically with the RISC complex constitute regulatory targets and, similarly, some computational methods only aim at predicting physical interactors for RISC. Besides specific limitations, which we discuss for each method, the mere concept of assuming a functional role for every detected molecular event is likely to identify many deceptive interactions (i.e., interactions that really exist at the molecular scale, but without controlling any biological function at the macroscopic scale). In order to select biologically important interactions, some computational tools interrogate the phylogenetic conservation of microRNA/mRNA interactions, thus theoretically selecting only biologically relevant targets. Yet even comparative genomics can yield false positives. Conceptual and technical limitations for all these techniques tend to be overlooked by the scientific community. This review sums them up, emphasizing on the implications of these issues on our understanding of microRNA biology. The authors wish to thank Dr. Isabelle Busseau and Dr. Séverine Chambeyron for critical reading of the manuscript.